PRODUCT: #LC225, 1-1/2", 4#, Lead Cap / Counter Flashing for Vent Pipe (fits L225). Price/Each. 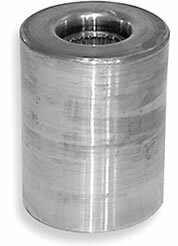 USED WITH: 1-1/2" Pipes (1.9" OD) and #L225 series Pipe Flashings. The L-Series Flashing with Counter Flashing protects the entire vent pipe making it watertight. The seamless counter flashing ties the vent pipe and flashing together without compromising the integrity of the flashing. Venting capacity is maximized while the pipe and or flashing are allowed to expand and contract. The counter flashing is simply placed on top of the flashing and fits snugly within the pipe and over the flashing. No caulking or fastening is required.